Anyone who has used an iPhone 4s in the last couple years probably knows how painfully slow it can be. This isn’t just because it’s an old device though. The main reason the iPhone 4s performs so slowly these days is due to it being able to run iOS 9. It is pretty clear that Apple purposely made iOS 9 available for the iPhone 4s in order to slow it down, giving people a reason to update to a newer device. But what if you could get back to an older iOS version, instead of being stuck on iOS 9? With the release of the new Phoenix jailbreak, now you can! Before the new jailbreak was released, it would only be possible to downgrade the device if it was running iOS 9.3.4 or below, which most weren’t. However, now that it is possible to jailbreak the latest version available for the iPhone 4s, any device can be downgraded. For this method, you don’t need to have backed up SHSH blobs in the past. You do however need to acquire some SHSH2 blobs for either iOS 6.1.3 or 8.4.1 (depending on which version you want to downgrade to). This will only work with the iPhone 4s. 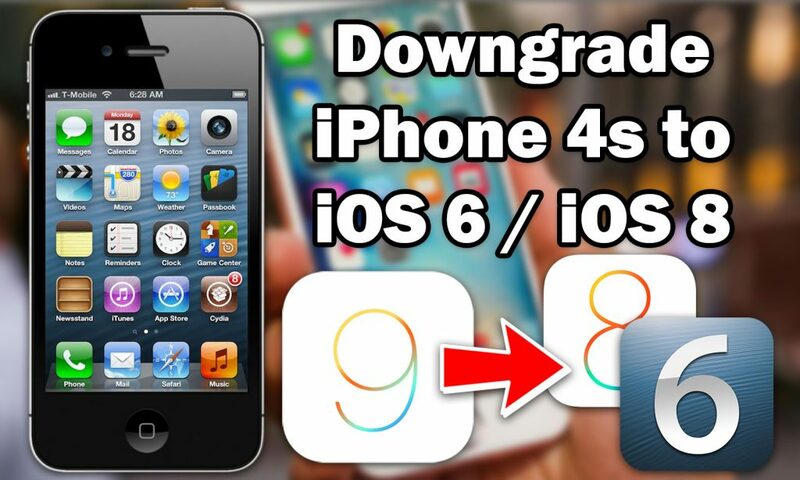 This guide will only show you how to downgrade to iOS 8.4.1 or iOS 6.1.3. It is possible to downgrade to other versions if you have SHSH blobs for them, but you would need to use different files. Your device needs to be jailbroken in order to do this (it does not matter which iOS version). Click here to see how to jailbreak iOS 9.3.5. Plug your device into your computer using a lightning cable. Navigate to the summary page for the device within iTunes. Click on the serial number until it changes to ECID. To copy the number click the Edit tab in the top tab bar and then click Copy ECID. Open Cydia on your jailbroken iOS device. Search for and install UDID Calculator. Open the newly installed app and copy the ECID value within. Download one of the two downgrade kits from the links above. Make sure to get the one for the iOS version you want to downgrade to. Extract the .zip file to reveal the files needed to downgrade. *An easy way to insert the path into Terminal is to open the folder, click and hold on the folder icon at the top of the windows, then drag it onto Terminal. This should create a .shsh2 file for the iOS version you selected. If it does not work, make sure you entered the ECID (e.g. 83F5A037D52) and iOS (e.g. 6.1.3) version correctly. Open the Cydia app on your iPhone and tap on the ‘Sources‘ tab at the bottom. Once there, tap the ‘Edit‘ button in the top right, followed by the ‘Add‘ button in the top left. A pop-up should appear asking for a Cydia repo link. In this box, type ‘repo.tihmstar.net‘. Tap the ‘Add Source‘ button to add the repo to Cydia. Once the repo has been added, go back to the sources tab and navigate to the ‘tihmstar beta repo‘. In here, find the package called ‘kDFUApp‘ and install it. Exit out to the home screen, and open the new kDFUApp icon. In here you should see 4 toggle switches. You need to enable each of the switches one by one, starting at the top going down. Make sure each of the switches finish what they are doing before moving onto the next one. Once all switches have been turned to the on position, tap the green ‘enter kDFU‘ button at the bottom. This will put your device into kDFU mode. Make sure your iPhone 4s is plugged into your computer. At this point you now have everything you need in order to perform the downgrade. In the text file, replace ‘<Blob>’ with the name of the SHSH2 blob you saved in step 3. After the name has been added, copy the entire command and paste it into the Terminal window. Once it is in there, press the enter key on your keyboard. If everything was done correctly, your device should now begin restoring to your chosen iOS version. Make sure not to unplug your device or turn off your computer during this process. After about 10-15 minutes, your device should boot up in either iOS 6.1.3 or 8.4.1! This will not work if you’re trying to do it via virtualbox, terminal can’t find path to downgrade toolkit. This guide just helped us downgrading a phone for a desktop documentary film project. Thanks so much!!! The downgrade kit file is taking a lot of time to download, the speed is very slow. Is there some way to download it faster? Thanks! Hi, I can not make SHSH for downgrade. iPhone 4S with 9.3.5 and my mac is with MacOS High Sierra – may be this is problem? could not retrieve serial number – and downgraded failed. why ? hi there. thanks for posting the instructional. I am working on an iPad one downgrade. All steps above work however since the iPad one was not LTE capable it would have no need for the iPhone 4 baseband item. can you please message back with any corrective steps that I will need to follow to complete the downgrade of iPad mini Wifi-only model ? Thank you downgrade kits from 9.3.5 to 6.1.3. my old phone feels much much better with the more optimized ios. Can you make a kit for iOS 7.1.2? Hello. My phone is not activated. Sim not supported and how can i enter on device? How can i jailbreak? Thank you. I did the process and it works thanks, but i want do the same with another 4s but the phoenix App cannot finish the install because apple did not sign the app anymore since monday, so what should i do? It still works here on my side as of today. Tried both 8.4.1 and 6.1.3 and they went smoothly. can i do this on linux? I tried rebooting the mac and reconnecting the device as well, yet the error still occurs. Any suggestion pls? I have never had any issues with it so it should work. Is there a problem if we take the shsh2 file with iOS 6.1.3, which we can have with coolbooter? Make sure you are connected to the internet. If you are, reboot your mac and try again. I do this with vmware. I also connect iPhone with usb to open iPhone, but the iPhone does not appear in iTunes. ITunes connects automatically when i plug iphone. This indicates that the iPhone is detected by the machine.